Your giveaway bags always look so interesting. What a nice idea!! Love surprise goodies! I would love to win this bag of goodies! My tween would LOVE to steal this from me! I love your website and this giveaway sounds great. Thanks for the chance. Thank you for the great give aways! awesome bag!! thanks for the giveaway! Beauty grab bags are always such fun to get! wife would love this. thanks! Would love to win this! Thank you!!!!! Thanks for the amazing giveaway! Love the site! looks great, looks like some stuff i need is peeking out! Great Giveaway! Thanks for posting such great deals! Thank you for this giveaway. It looks amazing! I would love to win! I love free stuff! Thanks! How fun is this:)! Love your site! Pick me! LOL. I love your site. Would love to win!! Thanks for the chance! Wow what a great giveway. I would love to freshen up my beauty for back to school! 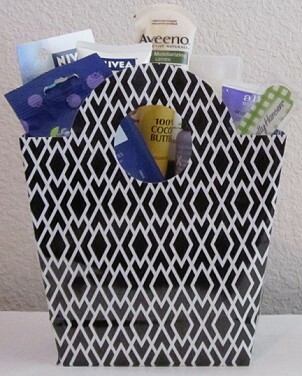 I saw the Aveeno lotion popping out of the top…It is one of my favorites and I just purchased the $5 gift card deal a couple weeks ago. GREAT GIVEAWAY…love the chance to win a basket of goodies!! THANK YOU!!! Pretty please? I’d LOVE this one!